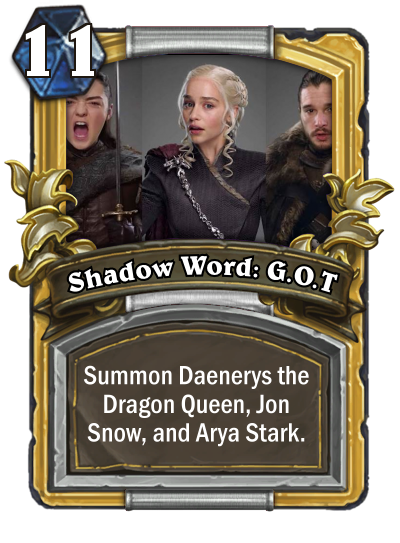 Please Blizzard, make this happen! This link "see this in our wiki" point to the absolete card "Fade" instead of the proper card. Please fix. <snip> He is merely saying that since warriors almost always have a lot of armor thanks to Justicar Trueheart, Shield Block, etc, Shield Slam is a very effective 1 mana removal tool that is also very consistent. this card is the shinning example of good removal destroys a big threat and lows you to answer with a threat of your own. Blizzard should make a card called 'Barry Blotter' with 4 attack. And make him immune to spells. 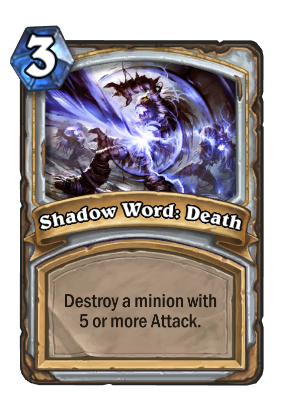 I think Priest has the most overpowered basic card..
Northshire cleric, Mind Control, Holy Nova, Shadow Word..
Power Word Shield, Mind Vision and Divine Spirit is a good card also..
And don't forget about Flamestrike and Assassinate.